A lone coyote ponders the winter landscape — or perhaps its next meal or mate. Photo by Myles Dannhausen Jr.
It’s Valentine’s Day weekend, and love is in the air. But in the vast fields and forests of the Kewaunee/Door County peninsula, there’s no need for roses or chocolates. It’s mating season for coyotes, red and gray foxes, wolves, cottontail rabbits, snowshoe hares and raccoons. Coyotes, especially, have been on the move. 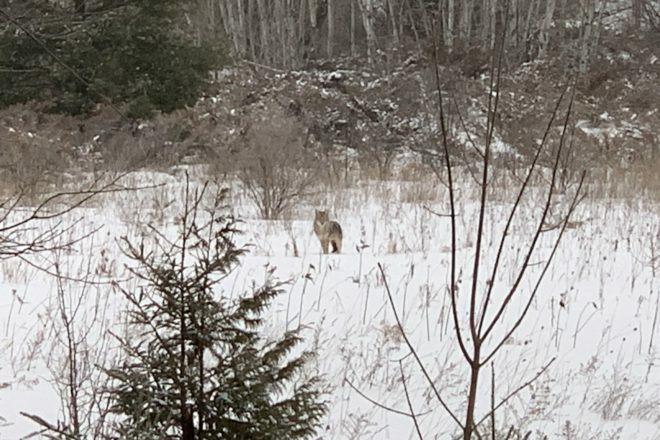 Increased sightings of the normally nocturnal canid may be due to the drive to procreate as well as a desperate need to feed in what has been a brutal stretch of weather for wild creatures. Unlike the cartoon character Wile E. Coyote – who repeatedly attempts to catch and eat Road Runner, but always fails – real-life coyotes are masters at finding dinner. Both scavenger and predator, the opportunistic coyote will dine on deer carcasses and roadkill and hunt rodents and rabbits, too. Backyard and barnyard chickens and small pets are vulnerable, and come spring, ground-nesting birds and their eggs are on the menu. Wild turkeys can be big contributors to the coyote’s diet the first two weeks after they hatch, when poults can’t yet fly to safe roosts. Adult toms, jakes and hens are occasionally caught, too, especially in deep snow and in cover where turkeys aren’t able to quickly escape to tree branches. When the hunting and scavenging is tough, coyotes aren’t picky. They can be seen pulling frozen, rotting apples off branches in orchards, or pawing through the snow to find fruit that fell earlier. Radio-collar studies in Upper Michigan and Wisconsin have shown coyotes to be deadly efficient at capturing and killing newborn and young fawns. Despite a year-round hunting season and no bag limit, the highly intelligent coyote thrives in Wisconsin. Hunting is typically done with trailing hounds, or the use of calls and decoys. Fresh snow by day (for scent-trailing hounds) and bright, moonlit nights (for hunters using calls and decoys) are optimal. Depending on the size and quality, coyote pelts often fetch $25 to $50 in the fur market. Door County’s recreational boating industry brings millions of dollars to the peninsula each open-water season. Statewide, the annual economic impact is estimated at more than $4.8 billion, supporting more than 25,000 jobs and nearly 800 businesses. There are more than 600,000 registered boats in Wisconsin. Nationally, the industry contributes an estimated $170.3 billion in economic activity. Retail unit sales of new powerboats were up about 4 percent last year to nearly 280,000 units – the highest total since 2007. The National Marine Manufacturers Association said the outlook for 2019 remains positive, with continued growth expected to bring a 3 to 4 percent increase in new sales. Sales of new freshwater fishing boats are estimated to be up 2 to 4 percent to 75,000 units in 2018. Fishing is the most popular activity done aboard a boat. New personal-watercraft sales are estimated to be up 6 to 8 percent to 68,000 units in 2018; personal watercraft are often considered a gateway to boat ownership. New pontoon sales are estimated to be up 4 to 6 percent to 58,000 units, and sales of new wakesport boats are estimated to be up 9 to 11 percent to 10,000 units. New cruiser sales – boats between 22 and 32 feet, popular for relaxing, entertaining and cruising – are estimated to be up 2 to 4 percent to 9,000 units. Have you ever seen blue stains near deer or rabbit tracks in the snow and wondered what in the world was going on? The answer is tied to an invasive shrub or small tree known as common buckthorn. Buckthorn is an ecological threat that has invaded forests, prairies, fields and roadsides. It leafs out early and keeps its leaves late, creating dense shade that eliminates regeneration of tree seedlings and understory species. It also produces chemical compounds that inhibit the growth of other vegetation. Researchers say the blue urine stains sometimes seen in the snow are a result of rabbits and deer eating buckthorn. One of the chemicals excreted in the urine turns blue when exposed to sunlight. Have buckthorn on your property? Get ID tips and learn how to eradicate it at dnr.wi.gov/topic/invasives/fact/commonbuckthorn.html. Door and Kewaunee counties are below the goal for the number of DNR-provided trail cameras for a citizen-science project. Snapshot Wisconsin offers an opportunity for individuals, families and students to get involved in monitoring the state’s natural resources. Learn more at SnapshotWISignup.org. As of Feb. 8, Lake Michigan was 21 inches above its 100-year average, and four inches higher than last year at this time. Water levels were 48 inches above the all-time February low, set in 1964, but still 11 inches below the all-time high, set in 1986.